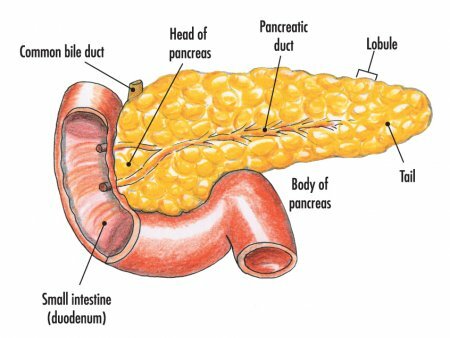 The pancreas is a glandular organ in the upper abdomen, but really it serves as two glands in one: a digestive exocrine gland and a hormone-producing endocrine gland. Functioning as an exocrine gland, the pancreas excretes enzymes to break down the proteins, lipids, carbohydrates, and nucleic acids in food. Functioning as an endocrine gland, the pancreas secretes the hormones insulin and glucagon to control blood sugar levels throughout the day. Both of these diverse functions are vital to the body’s survival. The pancreas is classified as a heterocrine gland because it contains both endocrine and exocrine glandular tissue. The exocrine tissue makes up about 99% of the pancreas by weight while endocrine tissue makes up the other 1%. The endocrine tissue is arranged into many small masses known as acini. Acini are small raspberry-like clusters of exocrine cells that surround tiny ducts. The exocrine cells in the acini produce digestive enzymes that are secreted from the cells and enter the ducts. The ducts of many acini connect to form larger and larger ducts until the products of many acini run into the large pancreatic duct.